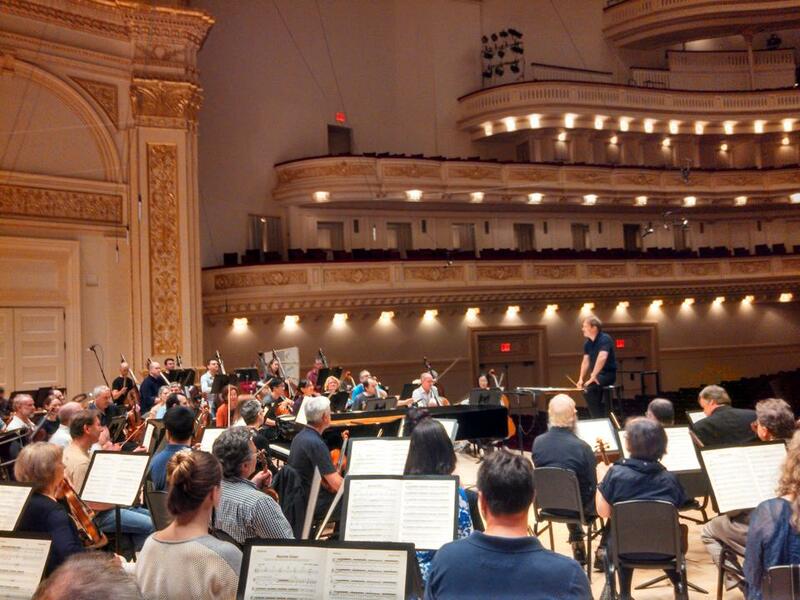 I’m still processing the experience of the Seattle Symphony’s concert Tuesday evening at Carnegie Hall — part of this week’s Spring for Music series, which will sadly constitute the final chapter of that worthy festival’s history. By now the program itself is as familiar as a friend. I heard the second half twice in Seattle, some rehearsal sessions, and the entire program last Friday during the SSO’s epic “preview” evening of the Carnegie adventure for Seattle audiences. But Tuesday included an extra dimension of excitement: the New York premiere of Become Ocean, the reactions of major critics in a world music center, and the unmistakeable ambience of Carnegie Hall itself. Even disregarding my obvious bias, this was received as a triumph for the amazing talent of the Seattle Symphony and its music director Ludovic Morlot. Of course there’s always a substantial amount of guesswork and gut instinct to rely on when it comes to a new composition. Most premieres tend to be somewhere in the vast “middle” range of quality and potential durability, but it’s certainly all too easy to get it wrong, to err in the direction of fatuous dismissal or foolhardy hyperbole. I know I’ve been guilty of both. So it’s all the more thrilling when instinct kicks in early on in a first encounter with a piece — as it did for me and the John Luther Adams — and you sense that this might be an even greater achievement than you could have reasonably expected. On both occasions I was able to share the experience with trained musician friends who reaffirmed this “instinctual” response to Become Ocean. This time I found myself tuning in even more to an underlying sense of elegy in the music. Certainly JLA’s big orchestral piece is at the furthest possible remove from any New Agey connotations or glib “environmental” message that some descriptions I’ve seen imply. (That’s not to deny or diminish the composer’s environmental commitment, which is not reducible to a bland gesture of political art.) Instead, this is challenging music, requiring a major effort from the listener while at the same time profoundly engaging the emotions. The days of either/or cliches like “tough” modernism versus “easy-listening” neo-Romanticism should be behind us. There’s so much to say about this music and its effect, so much about its implications as a commission, that I’m working on a profile of John Luther Adams and Become Ocean. More on that when the time comes. –On that score, I was puzzled as to why Martin Bernheimer, in his positive review, insists on labeling Become Ocean “an extended tone-poem.” Even the loose or distant mimesis traditionally associated with the Romantic notion of that genre is merely one level to which JLA alludes. –At New York Classical Review, George Grella found the programming concept to be mere “window dressing for abstract music about form, structure, and time.” Fair enough, but I disagree with Grella’s assessment of the orchestra’s playing in the Debussy as “surprisingly thin and light.” It was, in my opinion, anything but — in fact, unusually, and unconventionally, muscular and finely articulated, very far from “idées reçues” of French “Impressionist” music. Incidentally, I notice all these critics are male and would love to see a female critic’s reaction to this music. I know my pianist friend Judith was impressed on her first hearing, aptly likening the experience to an extended encounter with a Rothko painting. But after the first 20 minutes or so, the musical ideas had pretty much run their course, and there were no further developments to justify sustaining the piece. (Some listeners in the balcony areas made a discreet but early retreat.) At least the music fell gratefully on the ear, delivering consonance rather than dissonance, and in its very length, “Become Ocean” evoked a sense of vast oceanic scale. “Become Ocean” was wonderful. It is the perfect piece for just putting your head back, closing your eyes and letting the sounds happen around you. It conveyed what it must feel like to be in Alaska near the ocean and the forests. The piece had a refreshing and genuine feeling, and somewhat of the personality of American experimentalists Charles Ives and Henry Cowell. Morlot was the perfect conductor for this work. Clearly the piece has its roots in Debussy’s “La Mer” and the ocean passages of “Pelleas.” As a French conductor, Morlot was able to conduct all of those “Debussyiste” sea rumblings (bruits, in French). It would be a great piece to have on a CD at home. –(c)2014 Thomas May. All rights reserved. 3 Responses - Comments are closed. Melinda Bargreen’s comment was stupendous in its very precise missing of the point. To wit: after 21 minutes, the musical ideas had run their course precisely by design, and the remaining 21 consisted of an inexorable unwinding of those ideas. Because she admitted to having heard Morlot’s opening remarks, her comment was all the more ironic. Alex Ross gets it: watching the scenery recede is a different experience to watching it approach. The lull at measure 420 is all the more of a sad recession when we remember its predecessor at 210 and know we are closer to the end of the journey. On re-reading, I should have acknowledged that I would have no complaint about a review noting that there was no new material after the halfway point, and that the result was uninteresting, or even tendentious. I could be sympathetic with the view that there are no new ideas after the first few phrases, and the work is tedious in general. It was just the choice of the fulcrum moment as the start of “nothing more new”, without acknowledging the design, that struck me.